Three months after the defeat of the WWW (two months if you played Network Transmission), the world is at peace. Well, only for those three months because NetCrime is on the rise thanks to a NetMafia organisation only known as Gospel. Lan Hikari and MegaMan once again set out to rid the world of evil, and make some friends on the way. Shoutouts to the people who have been painfully watching me try to lower this for the past few weeks, and to Tterraj42 for bouncing some ideas around with me. 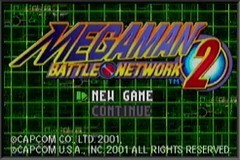 Mega Man Battle Network 2 is the second installment of the Mega Man Battle Network series on GBA. RNG manipulation is the bread and butter of the Any% Glitchless category, and it carries its weight throughout the run. Everything from battles to chip drops is manipulated in some way. I won't bore you with the entire mechanic explanation, but throughout the run you'll see me editing the chip folder by adding, removing, and rearranging chips in specific orders, then restarting the game on certain frames, usually determined by audio cue. This manipulation is very important, since the focus on quick battles lies within Program Advances (PAs); PAs combine chips to create powerful attacks that dispatch of bosses in seconds. The PAs used are GutsShoot (Guard * + DashAtk G/* + GutsMan G) for 400 damage, and Gater (Wind * + Fan * + GateMan G) for 900+ damage. Now, for the run, I'll generalize what's going on by each split, as named by their boss. AirMan: Enormous time save on this split due to me discovering a very slick manipulation for Guard * chips that gives us at least 2 guaranteed Guard * on our first trip into Den Area. What was originally theorized to be slower due to setting up manipulations actually becomes incredibly fast due to the encounter chaining and sheer speed of the fights. The 1500z GMD is determined by audio cue, which I get on the second try. Definitely not a bad start at all. First try manipulations for Dash * chips and a first try on AirMan all led to a very satisfying 10:41 split time. QuickMan: First try GutsMan manipulation is killer, encounter yolo is successful, and all manipulations go as planned except for the final fight of Gauntlet 2. A mis-timing on my part leads to an additional turn becoming necessary. Bomb Comps/QuickMan fight are standard to great, with a quick kill on QuickMan for the 26:05 split time. CutMan: We use and abuse GutsManv2 G and Dash * for their massive damage to clean up every fight. Failed manipulation on the triple Swordy fight due to poor text mashing. First attempt manipulation for Gauntlet 4. A fair trade, in my opinion. CutMan is a joke and shouldn't even be in the game. 45:22 split time. ShadowMan: I love ZapRing2 B manipulation. Another recently discovered addition to completely bypass the random in RNG. Fabulous split, AquaCust (the best style in the game) and a dead ShadowMan at 1:00:20. KnightMan: Excellent GateMan v1 and v2 manip, excellent ThunderMan manip, and an overall clean segment throughout. 1:18:18 split time. MagnetMan: Furniture and corners are dicks and cost me a few seconds. Talking is hard. 1:27:20 split time. FreezeMan: Why is this split so long? Recent route change led to more use of the piercing SilverFist E chip which helps save time both on reset timing (it's about second and a half faster), but saves on the PA loading cutscenes. AquaCust allowed for a skipped manipulation as well. One failed manipulation against the Dominerds, yet this was still the fastest this segment has ever gone. 1:57:28 split time. Gospel: Seriously, Boss Rush 1? It's given me so many problems lately and probably needs a re-worked manipulation set up, but at least the issue happened on the final fight of the gauntlet and at least we got our PA on the second turn. A dark spot in an otherwise exciting last split. Final split at the PET ding, which was 2:12:17. Final thoughts: 2:11 is possible, but that's a grind not worth doing at this current point in time. The recent route changes have cut over 2 minutes out of the original world record run posted on SDA, which is absolutely incredible. Very satisfied with the end product. Thanks for watching this run!